Sorry for the delay. My laptop is acting up and I couldn’t connect to the Internet, for about 3 weeks. Below is the recipe for the Tequila chicken wings. Its nothing great but I hope it comes out just as good as I made them. I would like to state that this is my second attempt at making these wings. The First time I burned them horribly, I feel asleep while cooking. The second time I did not add enough Tequila and forgot the limes. This time I cheated and used the Mojito Lime Marinade from McCormick ( got it from Giant on sale). 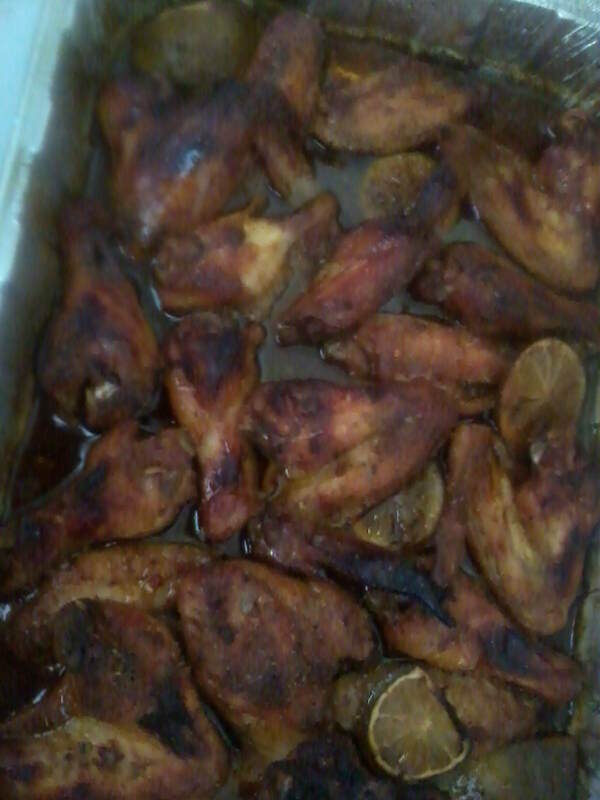 I did add more Chili powder and I also glazed the wings with Honey. I think they came out perfect! People who ate them at the Cinco de Mayo party I went to last week enjoyed them! I hope you enjoy them also. 1. Clean wings add tequila, 1 packet of the Mojito Lime Marinade, Slices of lime. Add the oil that is suggested on the packet. Coat the wings and Marinate overnight. 2. Place the wing in a baking dish with all the juices from the marinade. Take the second pack of marinade that that is mixed with chili pepper and cumin and sprinkle over the wings. 3. Drizzle some honey over the wings and bake for 30 -45 min covered. 4. Remove the wings and turn them over drizzle more honey over the wings. Than bake for another 30-45 min. this time with out a cover. I hope it comes out just as good. So today in the DMV had an imaginary snow day! Yes it was supposed to snow 4-8 inches and Baltimore only got rain. SO I went into the kitchen and cracked open my 1,001 cupcakes & other tempting treats cookbook that I got for Christmas ( Thanks Beth!). 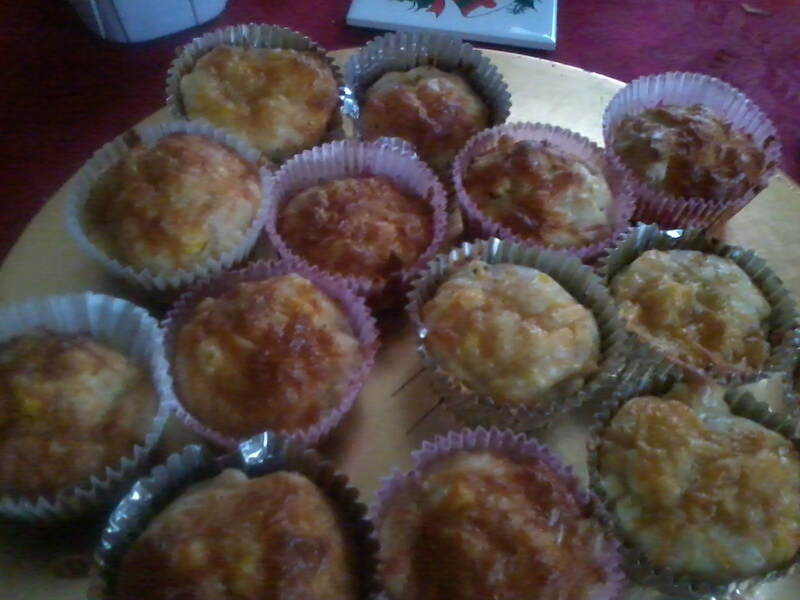 I tried the chicken and corn muffins. I decided, that it was missing something Cheddar Cheese!!!!! So I added ¼ cup of cheddar Jack Cheese and add some cheese to the top to melt over the top. Initial reaction was that it was ok, it needed something extra. It was fulfilling and delicious, and would make a great lunch meal like one muffin will fill you up. I hope you enjoy it and make them one day maybe on your imaginary snow day or just on a rainy day. I did make modifications so I will provide the books original recipe than my changes. Preheat oven to 400*C. Grease a muffin pan. Heat 1 tablespoon of the oil in a skillet. Add onion and cook for 2 minutes. Add chicken and cook for 5 minutes. Remove from heat and let cool. In a large bowl sift the flour, baking powder, salt and pepper. Place the eggs in another bowl, beat eggs. Than beat in buttermilk and oil. Add the dry ingredients and mix . Then add chicken and onions mix. Then add corn. Stir until combined but do not over mix. Spoon the batter into the muffin pans. Bake for 20 mins. Then Garnish with paprika. Follow the instructions above, except add in Cheese after the corn. Garnish the spooned muffin mix with cheddar and bake for 20-25 minutes. Allow to cool for 5 minutes and serve warm.